Just a minor update: my MacBook Pro has made it safely to Texas, and is being operated on (hopefully) as we speak! And if that ain’t science, then I don’t want to be a scientist. This entry was posted to Apple, Intel, MacBook Pro. Both comments and pings are currently closed. Thanks for reading! Unfortunately, Google is not always right. While it is obviously right for MacBook, it completely fails on this other example. is that chart flipping me off? Wheres the love?!? Ok. Here is my deal. I bought a brand new MacBook Pro this weekend. I noticed the CPU Whining noise two hours after getting home with the machine. The noise is very annoying. I also am experiencing slight noise in relation to the brightness setting on my display. Like I said, the noise is slight but noticable. I would like to thank Daniel for this blog, as now I know that I am not crazy and being nit picky! All that aside, I am really pissed that I just spent top dollar for what I believe to be (when it comes to computing) a superior product. I paid top dollar, and I have to run a program to trick the cpu into stop whining? This is BS. Does anyone have any tips on what to say when calling apple? I want to actually receive service, for at least the noisey screen. I am not going to tolerate any noise like this from an apple product. I mean, christ, I work with cheapo Dell Laptops all day long and I have never had any problems with infuriating sounds. BTW: Heres is how I deal with the sound. Screen: All the way dark, or all the way bright. Whats interesting is, after the screen is all the way bright the sound comes back.. I hit the “brightness increase” key and it goes away, even though the brightness is already maxed out. I start and close comic book, and never touch ichat, I use AdiumX instead. 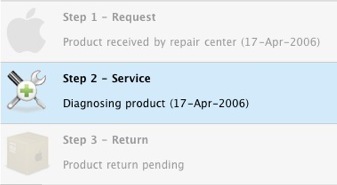 My MacBook pro, the 2ghz model is also at the Texas facility getting repaired with the same status btw! One note – why is Apple so slow on their service? Other companies selling high end products do overnight swaps and replacements for their customers. 5-7 days for a repair for a brand new laptop with this price is really disappointing and unacceptible as well. In fact I called the Apple store and got a Issue # in case my MacBook comes back with issues so I can return it right away instead of being screwed out of my 14 day return period. Apple has had my brand new laptop longer than I have (me 3 days, Apple between shipping and service 7 days) and that really really bothers me. Good luck with the ‘book repair. good luck with the service. it seems weird to me that the cpu whine doesn’t happen when i’m in windows (through boot camp). 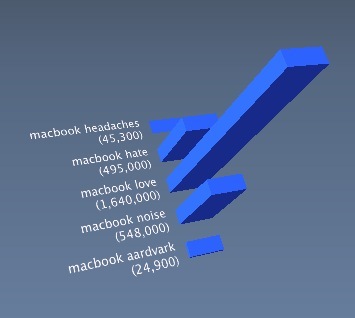 AH, 3D charts for 2D data, don’t ya just love it.